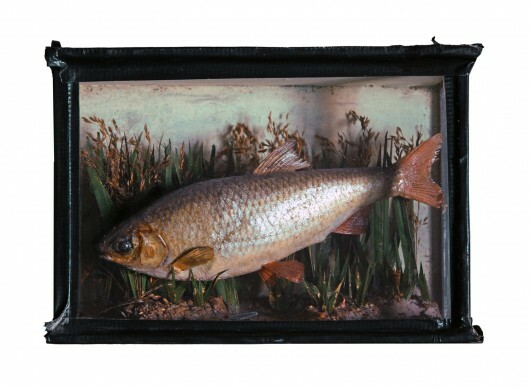 Safe within the confines of its glass house, my Grandmother’s carp held council over her pine-paneled living room, gazing outward from the fireplace mantle where it floated in a thick musk of wood fire and cigarettes. Relatives uncomfortably recall the prior home of the fish, perched intimately on the back of the bathroom toilet. My memory of it, however, is much more ennobling and begins and ends on the fireplace mantlepiece, far from the woes of high humidity and unexpecting guests. From its central post in the living room, bordered on one side by a stack of yellowing National Geographic magazines documenting the moon landing, the fish stared fixedly across the room at a 1910 Shingle Mill portrait of Swedish immigrants in Arlington, Washington. They had both, at separate times, travelled four thousand miles over oceans and land – one fleeing poverty, the other an English pub – each to find themselves on the walls of this 1940s Pacific Northwest bungalow. Here they held silent communion with abandoned wasps’ nests, medieval grave rubbings and fine oil portraits of unknown people’s dogs. Free of any explanatory text or narrative, the carp seemed woven into the very fabric of the room itself, a plain and simple fact of the place. As were many of the orphaned objects in her collection, the carp’s case was held together by a thick and sure layer of black electrical tape. Through the impressionable eyes of a young grandchild, the room and its contents formed a web of mysterious coherency around the carp. As in the seamless vision of a museum space, each object served as an essential element to the whole, a piece in a larger puzzle, each preserving and hinting at the slippery and uncatchable desires of their collector. Through the impressionable eyes of a young grandchild, the room and its contents formed a web of mysterious coherency around the carp.